As kids, parents and teachers gear up for the start of another school year, families should consider taking a second look at their child or teenager’s backpack. Backpack safety is not only an adult issue; backpacks that are not well suited to a young person’s body or stuffed with too many items could lead to chronic back pain in young children and adolescents. The backpack should fit your child’s torso length. Avoid those that are too wide or long or backpacks that hang too low on your child. Find backpacks with padded backs and shoulder straps that cushion the bag against your child’s body. Encourage him or her to wear both shoulder straps! If the backpack has additional hip and chest belts, that’s a plus! Additional straps help evenly distribute the weight of the backpack. The more compartments, the better! Compartments ensure books, gadgets and other school materials stay in place throughout the day. Coach your child to pack essential school supplies, so as not to overload his or her backpack with unnecessary items. 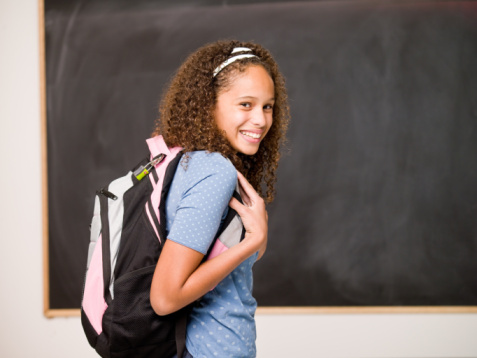 A well-packed book bag should not impact your child’s posture or cause any discomfort or pain.